Is Brandon Sanderson the new King of Fantasy Authors? For a long time Tolkien was the ‘King’ of fantasy authors. These days he is regarded as the grandfather of fantasy, highly respected, highly regarded but no longer is his work the pinnacle. So who usurped him? Hard to say really, there have been many great authors since him, Hobb, Card, Jordan, Martin, Erikson, Esslemont, Abercrombie and others. I’m going to touch lightly on a few authors here. Hobb is such a great writer, she made us love, hate and get annoyed at Fitz all at the same time. Her books are very different than Tolkien’s though. Martin was called the American Tolkien and yes I totally agree. His world building is immense and characterization spot on. However he has let himself down by waiting so long between books 4 and 5. Eight years is much too long for any book in any series to come out. The books A Feast for Crows and A Dance with Dragons have been blasted a little that they aren’t interesting and the characters have lost their charms, even the most likable ones. Malazan is epic and detailed, as much so as The Lord of the Rings. It has been compared to The Black Company by Glen Cook and A Song of Ice and Fire by George R.R. Martin. Being compared to such great writers is well…great, but they don’t supersede them. Having only sold 250, 000 books worldwide doesn’t help. 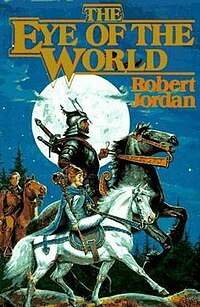 That brings me to Robert Jordan. Before there was Farseer, A Song of Ice and Fire or The Malazan Empire there was The Wheel of Time. It has sold millions and millions of copies world wide and are many peoples reason for getting involved in reading fantasy. But…and it is a big but…Brandon Sanderson is currently ghost writing this series since the death of Jordan in 2007. It is because of Sanderson that The Wheel of Time has been getting a bit of a revival. Many people have said that Book 7 to 11 have been very droll and I’ve only heard positives of the two books Brandon Sanderson has helped to write (with the third coming out around November 2012). A big note is that Harriet McDougal (Jordan’s wife) chose Brandon Sanderson to ghost write after she read his Mistborn series. He’s since written Warbreaker a stand alone novel, The Alloy of Law (a follow up to Mistborn) and the start to his epic series The Way of Kings, plus his Alcatraz series. Sanderson has written or helped write 13 books since 2005. Which is on average 2 books a year, which is insane. You would think someone that writes that much would have some bad books, but from what I have read they are all quality. Is he the new King of fantasy? If it was up to me I would definitely say a big yes, but that’s the beauty of different readers, we all have different opinions. What say you?